UF education technology researcher Pavlo “Pasha” Antonenko adjusts his EEG headwear on a study subject. UF education technology researcher Pavlo “Pasha” Antonenko has never been afraid to take risks and go against convention. His pioneering spirit emerged in the 1990s in his Ukraine homeland, where personal computers were scarce and there was no internet connection. Fast forward two decades, to today, and you’ll find him leading groundbreaking studies at the College of Education on a radical new approach for advancing and personalizing the still-fledgling field of online learning. Antonenko’s journey to UF started in the late 1990s when he was a high school teacher. He became fascinated with computers at a time when his hometown of Nizhyn, Ukraine had no internet connections and few computers. He began building and selling computers to supplement his income while he earned a master’s in linguistics in English and German languages. “I was one of the first people in my hometown to get an internet connection, but it wasn’t very good. I started building websites even before I had internet, but they were just sitting on my computer,” he recalls. His career path changed dramatically in 2002 when he traveled to Orlando to work as an interpreter at a conference on education technology, a discipline that wasn’t even recognized in Ukraine. But Antonenko had found his passion: exploring ways computer technology can improve education. “Everything I heard there and the people I met, I said ‘wow, this is what I want to do as my graduate education and job,’” he says. Within a few months, he and his wife, Yuliya, moved a half-world away to settle in Ames, Iowa, where he spent five years at Iowa State University earning a doctorate in curriculum and instructional technology and human-computer interaction. Along the way, Antonenko worked with Iowa State neuroscientists on one of his personal research interests—the use of electroencephalography (EEG) to monitor brain activity known as “cognitive load,” which is the amount of mental effort expended by the working memory during a learning task. EEG, which records the brain’s electrical activity, is most commonly used in medicine as a first-line, non-invasive method of diagnosing stroke and other brain disorders. It would have been intriguing to monitor Antonenko’s own brain activity as he thought to himself, “Hmmm, I wonder if EEG might be a reliable way to study the mental processes underlying learning.” He wrote his dissertation on the topic and became one of the first education researchers to use EEG to measure the cognitive dynamics of learning. After earning his doctorate and serving five years on the education technology faculty at Oklahoma State University, Antonenko joined UF’s ed. tech faculty in 2012. His appointment coincided with the education world’s identification of personalizing online learning as a global challenge and a top research priority of the U.S. Department of Education and the National Science Foundation. UF administrators also targeted research of personalized e-learning for investment of state “preeminent university” funds, which enabled the College of Education in 2014 to recruit top ed. tech scholar Carole Beal from Arizona State University, where she was conducting her own pioneering neuro-education studies. 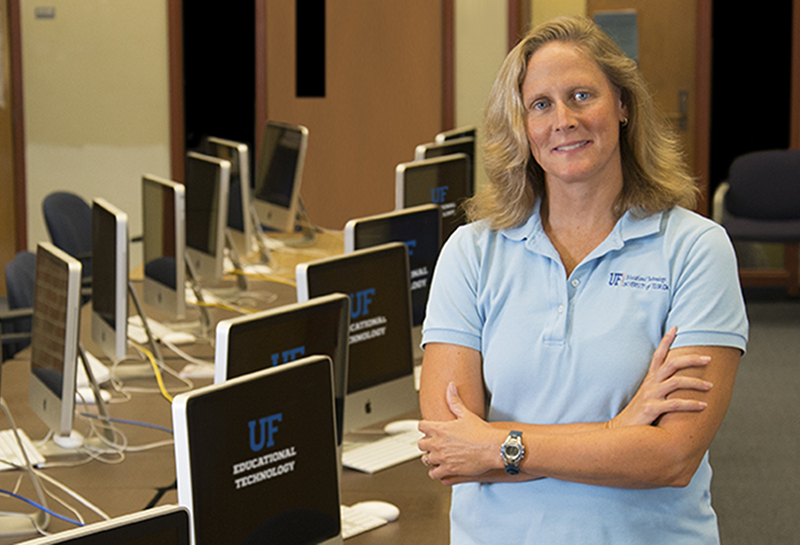 Beal became the first director of UF’s new campuswide Online Learning Institute. The College of Education made a priority of integrating neuroscience with education research to improve online learning at all levels. Pivotal developments during the 2015-16 academic year made that push a certainty. 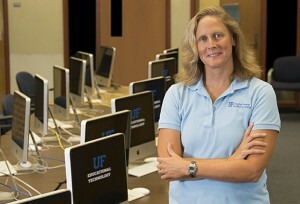 In 2015, Antonenko, Beal and UF education technology colleague Kara Dawson attracted vital grant funding to lead novel interdisciplinary research projects using wireless EEG brain monitoring and other neuro-technology to study how multimedia learning can be impoved for all students, not just those who test well on academic exams. These studies focus on education in the STEM disciplines—science, technology, engineering and math—areas in which the use of multimedia learning tools “has far outstripped the ability of research to keep pace with,” says Antonenko. Their focus on custom-tailoring instructional design for individual learner differences, rather than a “one-size-fits-all” approach, is a distinctive feature of their studies. “Virtually all research on multimedia learning methods has been performed on high-achieving students at elite research-intensive universities, where studies like this usually occur. We are evaluating these methods with more diverse student populations and those with special needs,” Antonenko says. In 2015, Antonenko became the first UF education faculty researcher to win 5 NSF grants in the same year. Antonenko heads a team of highly specialized researchers drawn from multiple institutions on a three-year study, supported by a $765,000 grant from the National Science Foundation. The researchers are gauging how effective technology-assisted learning practices are for a diverse group of community college students, which now constitute nearly half of all U.S. higher education students. The team, dubbed the Science of Learning Collaborative Network, includes top scholars in education technology, neuroscience, STEM education, neuropsychology, computer science and educational measurement. They hail from UF, the University of Massachusetts-Boston and Washington State University. Some 120 students from three colleges—Santa Fe College in Gainesville, Bunker Hill Community College in Boston and SUNY Buffalo State in Buffalo, N.Y.—are participating in the study. The students are screened for demographics and learning differences, such as working memory and visual attention levels, to ensure a varied test group. 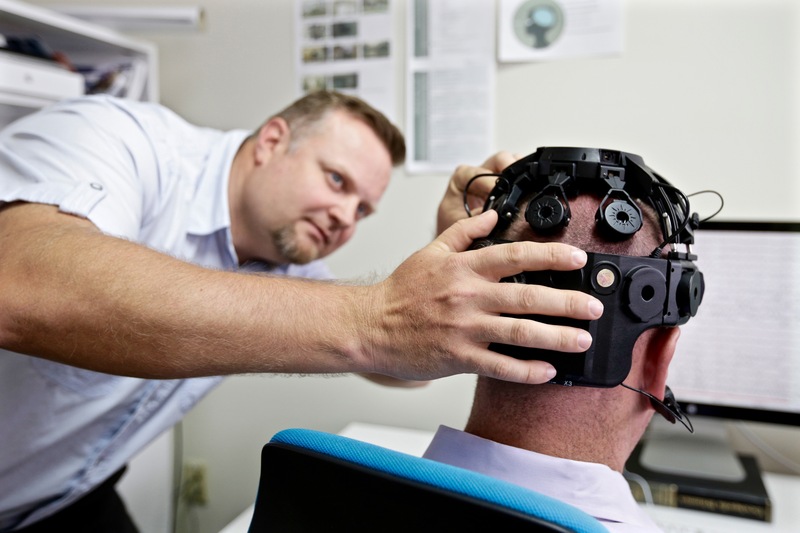 Team specialists in cognitive neuroscience are employing EEG and other high-tech methods, including functional near infrared spectroscopy (to measure neural changes in blood oxygenation) and eye tracking (to understand visual attention) to assess the students’ attention and mental processes while they learn using multimedia materials that include text, images, videos, animations and audio. The researchers hope to land follow-up NSF grants by demonstrating the effectiveness of their network’s organization, infrastructure and integration of diverse research strategies, along with their unique approach to personalized learning. UF co-researchers are ed. tech faculty members Dawson and Beal, and psychology professor Andreas Keil. Co-principal investigators are computer science and STEM education scholars Matthew Schneps from Massachusetts Institute of Technology and Marc Pomplun from the University of Massachusetts-Boston, and Richard Lamb of SUNY Buffalo State, who focuses on science education and measurement. Professor Dawson heads an educational neuroscience study focused on multimedia learning for students with dyslexia, the most common language-based disability. People with dyslexia typically have difficulty reading and processing words. Dawson was awarded $85,000 for the one-year project from UF’s Office of Research, which awards Research Opportunity Seed Fund grants to UF scholars for the merit and potential of their research proposals. Antonenko is a co-principal investigator. The study involves 72 college students with dyslexia, each participating in one of four multimedia learning settings while wearing wireless EEG headsets to monitor and record brain activity during the multimedia exercise and comprehension assessment. The student volunteers are drawn from four institutions: Santa Fe Community College and the universities of Central Florida, North Florida and South Florida. Dawson and her team will use their findings to evaluate the validity of merging EEG and behavioral measures and, ultimately, to develop new instructional strategies and materials that teachers can personalize for individual students with varied learning traits and backgrounds. Besides Dawon and Antonenko, the research team includes UF ed. tech colleagues Beal and Albert Ritzhaupt, dyslexia diagnostic specialist Linda Lombardino from UF’s special education program, and UF neuropsychologist Keil. Doctoral students participating are Kendra Saunders from school pyschology and Nihan Dogan, Jiahui Wang, Li Cheng, Wenjing Luo and Robert Davis from the School of Teaching and Learning. Matthew Schneps from the Harvard-Smithsonian Center for Astrophysicists also is collaborating. The researchers describe both educational neuroscience studies as exploratory, but Antonenko says he expects them to yield solid preliminary findings that may lead to follow-up NSF research proposals.